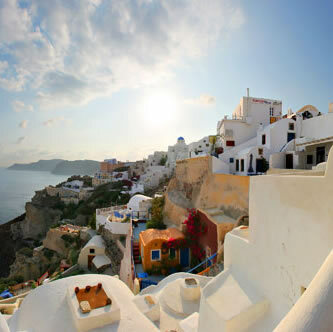 Do NOT lose the opportunity to see in a unique afternoon tour, taste local wines and famous attractions of island, well as the glorious sunset of Oia. Oia. The sensation of the first time you ever lay your eyes on this architectural gem, is truly something to remember for life. Your party will be semi-private with others on a comfortable, air conditioned Mercedes mini bus. The guide will come to take you from your hotel or from the nearest pick up point in case you are in caldera and there is no road for the mini bus. We start the tour from Profitis Ilias mountain for panoramic photos. Next stop, Argyros winery , that it is the most modern winery on the island and you can taste 4 local wines- local tapas and the famous chocolate vinsanto that they produce. The shared tour is every Tuesday, Friday and upon request.